Bishop Declan, his Mission for us all, and what we can do together. The Right Reverend Declan Lang is the Bishop of Clifton. Born in Cowes on the Isle of Wight in April 1950, Bishop Lang was ordained to the priesthood in June 1975. He was ordained bishop in Clifton Cathedral, Bristol on 28 March 2001. ​We have had the pleasure of Bishop Declan celebrating Holy Mass on Campus and at the Opening Mass of the Academic year on previous years. He also visits Father Bill OSM on Campus and at Father Bill's Parish Church on regular occasions. What is 'Mission - A Future Full of Hope' ? Bishop Declan launched the new diocesan vision ‘A Future Full of Hope‘ on Saturday 28 October, This document, inspired by Pope Francis, emphasises a ‘more outward focus’ and sets out a roadmap for the next three years which will focus on one aspect of the bishop’s threefold vision of Mission, Prayer and Communion. The aim of these three years is to give us the tools we need in order to be able to take a firm grip on the future that the Lord calls us to. The symbol of the anchor, which recurs through-out the document, reminds us that the anchor which holds us fast is the knowledge of God’s love for us. Watch out for events during the year to do with this first year of Mission. 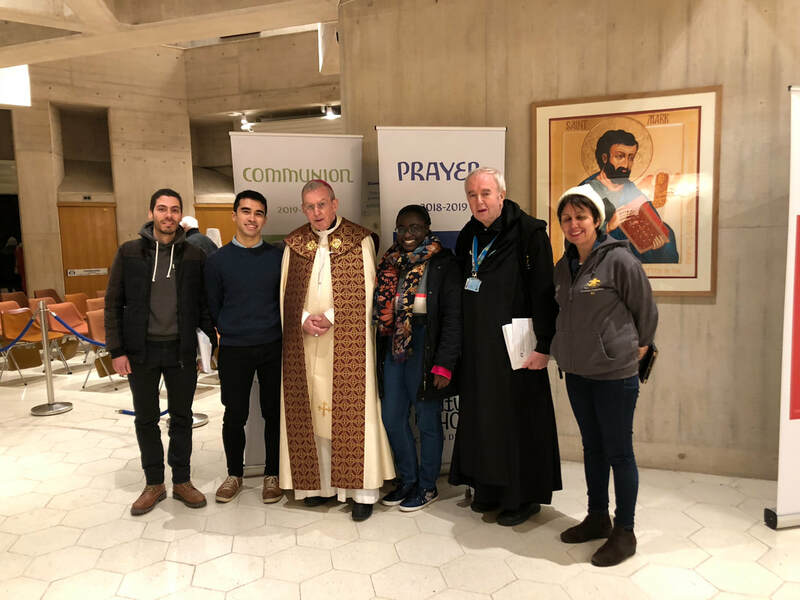 On Tuesday 27 November at 7pm in our Cathedral, Bishop Declan invited our parishes and communities to join him at a celebration of Evening Prayer during which he presented to each parish, community and school the resources for the Year of Prayer starting this Advent. During our journey through our diocesan Year of Mission, the Bishop encouraged us to read, pray and reflect upon St Mark’s Gospel and allow ourselves to be drawn every deeper into the life of a disciple called to echo the mission of Jesus. We tried to follow St Mark’s story of Jesus with fresh understanding and an eagerness to walk closer to the Lord who calls each of us to be his disciples. We have explored the Gospel of St Mark during our regular Lectio Divina meetings on Mondays at 6.15pm on U of Bath Campus as a part of the Bishop's Mission.